The German capital of Berlin played a pivotal role in the history of the twentieth century, as the capital of a combatant in both World Wars, the front line of the Cold War and later as the heart of a bold new Germany ready to step once again on to the European and world stage. Although many of its buildings have suffered damage over the years, Berlin’s most famous landmarks have been lovingly restored to their former glory in the later years of the twentieth century. 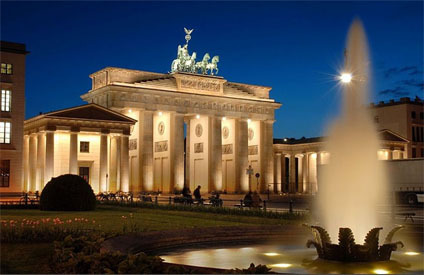 The Brandenburg Gate is one of the most famous symbols not only of Berlin, but of Germany itself. A representation of the gate features on some German Euro coins, reflecting its national importance. It was originally constructed during the reign of King Frederick William II of Prussia and was based on classical designs, particularly the Acropolis in Athens. It was damaged during the Second World War but escaped the large scale devastation that laid waste to other parts of the city. It remained one of the few crossings between East and West Berlin during the Cold War. Significant restoration work was later carried out and the Brandenburg Gate re-opened to the public in 2002. 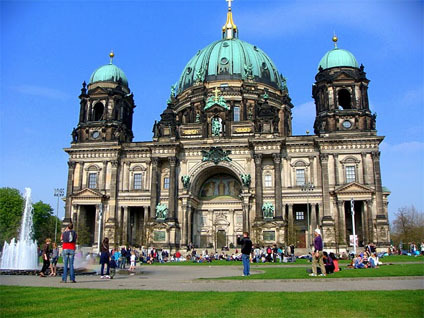 The Berliner Dom cathedral is unquestionably the most famous church in the city but many tourists are surprised to discover that the current building is only a little over a hundred years old. A succession of churches occupied this site until 1893 when Julius and Otto Raschdorf began to construct the present building in a flamboyant neo-renaissance style. It was inspired by St Peter’s Basilica in the Vatican City in Rome and opened to the public in 1905. The Berliner Dom was heavily damaged during World War II but was later reconstructed, despite the East German government’s general antipathy to religion. Another building which has had a turbulent history but which is integral to life in Germany today is the Reichstag which houses the modern German parliament. Its construction was started by Kaiser Wilhelm I in 1884 and completed by his successor, Wilhelm II in 1894. It ceased to function as a parliament between 1933 and 1945 and emerged from the war as little more than a ruin. It was later restored during the 1960s and later ushered in German reunification in 1990. For many people, the Berlin Wall which divided the city in two between 1961 and 1989 remains the enduring symbol of the Cold War. The wall was erected by the pro-Soviet East German government primarily to prevent its citizens from crossing into the pro-American West Berlin and became synonymous with political oppression and ideological division. The Berlin Wall famously fell in 1989 and was demolished shortly afterwards both by cranes and determined bands of Berliners. 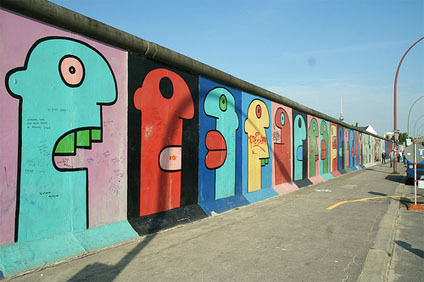 Today smalls section of the Wall survives in various parts of Berlin, including near Ostbahnhof and Potsdamer Platz. These are visited by thousands of tourists each year, as is a museum located near to the infamous Checkpoint Charlie Between 2004 and 2005 a temporary memorial was constructed in the memory of those who died trying to cross the wall. The Berlin Wall remains a contentious issue both in the city and in wider German life. The German capital is a city with a rich and complex history and really needs to be visited in order to fully understand it. Thankfully, regular flights to Berlin are available from most major European cities, making it easy to explore the city for yourself. Jennifer Adams is a part of the digital blogging team who write about subjects like travel such as flights to Berlin on behalf of a growing number of airline brands. To keep up to date with the latest in travel news.